EverWatch holds the General Services Administration (GSA), IT-70 Federal Supply Schedule (FSS) Multiple Award Schedule (#47QTCA19D003Q). The IT-70 Schedule allows for agencies EverWatch to utilize our full range of Information Technology services to help meet their mission goals. 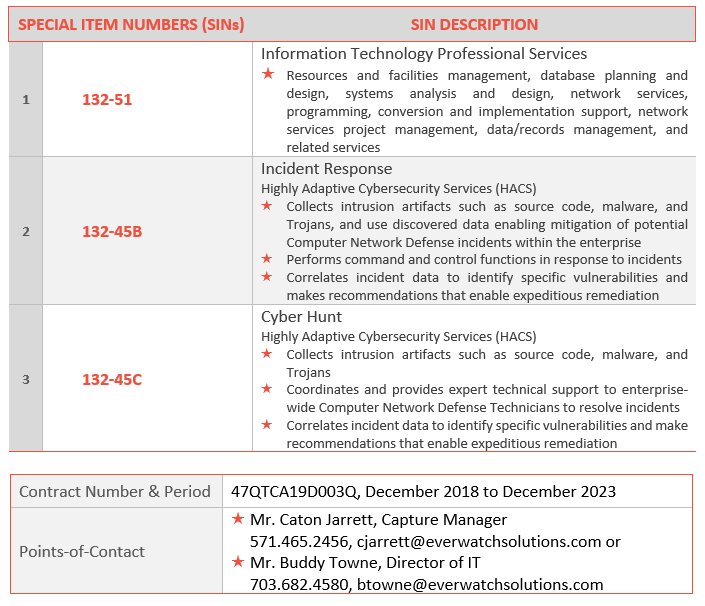 EverWatch is approved to compete as a prime contractor for awards under (SIN) 132-51—Information Technology Professional Services—including resources and facilities management, database planning and design, systems analysis and design, network services, programming, conversion and implementation support, network services project management, data/records management, and related services. EverWatch is also approved to compete under SINs 132-45B (Incident Response), 132-45C (Cyber Hunt) under GSA’s “Highly Adaptive Cybersecurity Services (HACS)”.